Arctic Race Front Suspension: Tall, lightweight ski spindles and widely spaced A-arms provide great torsion rigidity and strength. Angling the shock load back toward the rider's mass, results in optimal caster/camber to improve comfort and cornering. Tucker Hibbert Signature Series FOX FLOAT® 3 EVOL RC2 shocks and a sway bar provide excellent control and handling. Tucker Hibbert Signature Series FOX Shocks: This shock package gives you world class athlete shock calibration resulting in outstanding suspension and steering performance. You get FOX FLOAT 3 EVOL RC2 front ski shocks and FOX ZERO C2 and ZERO RC2 shocks on the rear skid. All shocks have genuine Kashima Coating for ultimate performance. 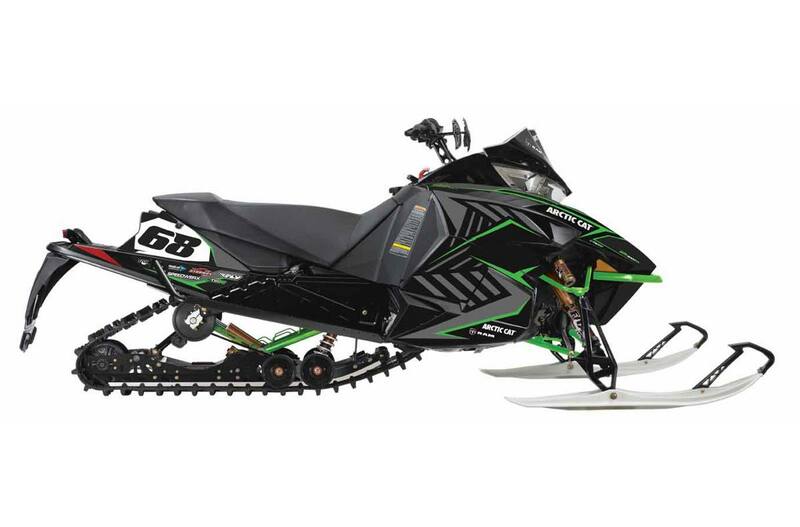 Custom Tucker Hibbert 68 Graphics: These exclusive race-inspired graphics are sure to attract attention. Tether Switch: For added safety, the tether stop switch instantly shuts off the snowmobile if any separation of rider and snowmobile occur. Custom Race-Height Windshield: The custom cut windshield adds style, and combined with the Arctic Cat hand guards, protection from flying debris is also on the menu. 68 Number Plate: Having #68 on your sled makes a big statement. So much, you may develop a bullseye on your back from your riding buddies. White Trail 6-in. Skis: Being seen in a pack isn't always easy. That won't be a problem when you have Tucker's signature white skis.